When you really want to take your sweet treats over the top, a stunning presentation is just the thing to help you. Adding a little decoration to your culinary creations can turn a delicious treat from a tasty dessert to a true work of art. If you’re new to the world of edible decorations for candy and baked goods, the sheer number of options can be a little intimidating at first. We’re here to help you find your way through this vast world of delectable and beautiful options. One of the easiest options for your desserts is sanding sugar. Sanding sugar can be used to make a sweet a little brighter and more colorful. From blue to orange to black, sanding sugar can help you to make the perfect presentation for your creations. If you’re looking to really amaze with your desserts, sanding sugar gives you the chance to create stunning designs on your cakes, cookies, brownies, candy and more. Another great option for taking your treats up a notch is edible glitter dust and flakes. 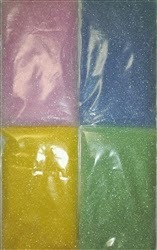 If you like to add a little sparkle to everything you do, edible glitter is for you! Edible glitter flakes offer a coarser glitter option for your sweets, while glitter dust adds a much finer luster for your treats. If you want to add a little more pizazz to your creations, decorative pearls and sprinkles are a sure bet. Whether you want red, white and blue sprinkles for a patriotic-themed sweet, confetti ghosts for a Halloween dessert or wedding bell sprinkles for an edible wedding decoration, there are tons of sprinkle options to choose from. Sugar pearls can be used to add a little class to a treat or to create a delicious border. Regardless of the dessert you plan to make, we can help you find the perfect edible decorations for your creation. Take a look around our store and find the best ways to liven up your desserts. Can’t find something you need? Just let us know and we’ll find it for you! What are your secrets for turning your sweet treats into works of art? Let us know in the comments below!